Sterling silver, real Coral, Picture Rock, Jet and Mother of Pearl. This is a very exquisite pendant that must not be overlooked! This piece of Native American jewelry is Navajo hand crafted by artist Patrick Lincoln, out of genuine sterling silver, along with real multicolor inlay. 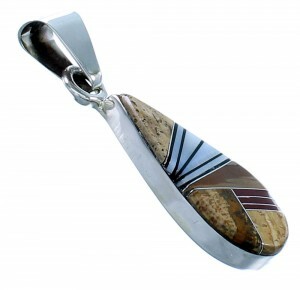 The inlay consists of: Coral, Picture Rock, Jet and Mother of Pearl. The inlay is carefully set, creating a wonderful tear drop shape. 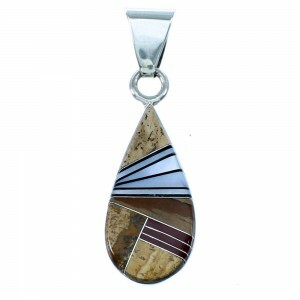 Thin silver lines can be seen highlighting the pendant for an amazing look. 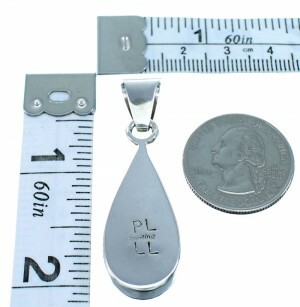 The pendant is stamped sterling and is hallmarked.